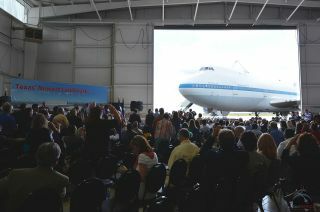 NASA's original Shuttle Carrier Aircraft, "NASA 905," is revealed as hangar doors open at Ellington Field, Houston, Aug. 22, 2013. HOUSTON — A NASA jumbo jet that for more than three decades ferried space shuttles across the country is now being readied for its own move, thanks to the support from the aerospace company that originally built the iconic Shuttle Carrier Aircraft (SCA). On Thursday (Aug. 22), Space Center Houston, the official visitor center for NASA's Johnson Space Center in Texas, announced The Boeing Company will provide the needed disassembly and reassembly of the modified Boeing 747 jet so that it can be featured in a new $12 million, six-story educational attraction. "We are proud the SCA will have its new home at Space Center Houston, adjacent [to] the Johnson Space Center, home of America's human spaceflight program," he added. NASA transferred ownership of the aircraft, known by its tail number NASA 905, to Space Center Houston in May. The 231-foot-long (70 meters) Shuttle Carrier Aircraft is 63 feet tall (19 m) and has a wingspan of 195 feet (59 m). Intact, it is too large to navigate the five miles (8 km) of city roads that separate Ellington Field, where it landed in October 2012, from the visitor center, where it'll be placed on permanent display. Once the SCA pieced together, a high-fidelity, full-scale mockup of the space shuttle — which arrived at Space Center Houston in June 2012 — will be mounted on top of the aircraft in the same configuration that the real orbiters were ferried. Space Center Houston plans to erect a tower structure, including an elevator, to provide the public with walk-through access to the interiors of the Shuttle Carrier Aircraft and the orbiter replica. "Thanks to Boeing's generous contribution, we will be able to produce an unparalleled attraction that'll showcase the wonders of NASA's innovation and technology," Richard Allen, president and CEO of Space Center Houston, said. "Once it's complete, the 747 [Shuttle Carrier Aircraft] will become a vehicle of inspiration, lending her wings to the dreams of imaginative students." The Shuttle Carrier Aircraft attraction is slated to debut in 2015. When the aircraft opens to the public, visitors to Space Center Houston will have the opportunity to learn about the role the Boeing 747 jet served from inside the plane. "The bulkheads of the 747 will house teaching facilities, immersive experiences, and rare artifacts that will thrill students, [exposing them to] the technical achievements of this historic program," Allen said. After riding an elevator to the main deck of the aircraft, guests will step out into a large-scale cyclorama theater surrounding a quarter-scale model of the shuttle mounted atop the SCA. Moving clouds projected across the walls and floor will serve as the backdrop for inspirational words, flight facts and quotes from individuals who were involved in the space shuttle program. As guests move toward the front of the aircraft, they will encounter a multimedia presentation about the history of NASA 905, its design and its role in the shuttle program. Using "hologram" rear-projection technology, visitors will be able to virtually meet the crew who flew the SCA, as well as the engineers who modified the aircraft for its use during the shuttle program. Behind the theater there will be an area devoted to further delving into the Shuttle Carrier Aircraft's history. Dynamic photos, archival film footage, and scale models will join a 55-inch (140-centimeter) multi-touch display deck, where visitors will be able to access the schematic designs of the aircraft before and after it was modified, as well as see what alternative options were considered to transport the shuttle. The gesture-controlled display will also include an in-depth archive of film, photographs, drawings and mission-related information from NASA 905's three decades of service. From there, visitors can ascend the 747's original stairway to see into the aircraft's cockpit and its shuttle attachment reinforcements. Back on the main deck and towards the rear of the SCA will be presented a series of "simulation stations" that will invite guests to experience the planning and training that both the flight and ground crews underwent in preparation for shuttle ferry flights. A virtual control room, wind-testing station and a flight simulation are planned. Concept art for the 747 Shuttle Carrier Aircraft at Space Center Houston showing the exhibits planned for inside the historic aircraft and orbiter replica. Built in 1970 and acquired from American Airlines in 1974, the original Shuttle Carrier Aircraft flew in wake vortex research studies at NASA's Flight Research Center (now the Dryden Flight Research Center) at Edwards Air Force Base, Calif., before being modified by Boeing for its new role as an SCA. It carried the prototype shuttle Enterprise aloft in 1977 and released it five times for piloted approach and landing tests. Renamed NASA 905, the aircraft then underwent further modifications for the ferry flight role it would have for more than three decades. Reaching a speed of Mach 0.6 (or 457 miles per hour), it flew 70 of the 87 ferry flights during the shuttle program, including 46 of the 54 post-mission flights from NASA Dryden to the Kennedy Space Center in Florida. NASA 905's last service to the space shuttle program was ferrying Enterprise and the space-flown orbiters Discovery and Endeavour, to their retirement homes in New York, Virginia and Los Angeles in 2012. It then departed NASA Dryden for the last time Oct. 24, 2012, flying to Ellington Field to await its final retirement and disposition. NASA 905's final time aloft was a pilot proficiency flight in December 2012. Click through to collectSPACE.com to see additional artist concepts for the interior layout of the 747 Shuttle Carrier Aircraft exhibit at Space Center Houston.